I’m very proud of our students at the Israel Aviation Industries (IAI) high school who learned how to build drones, construct missiles and take apart F16 turbo fan engines. This explains the presence of an airplane engine in the background of a visit by Minister Deri, Minister of the Development of the Negev and Galilee. In his former capacity as Minister of the Economy Rabbi Aryeh Deri met the students on their first day back at school. 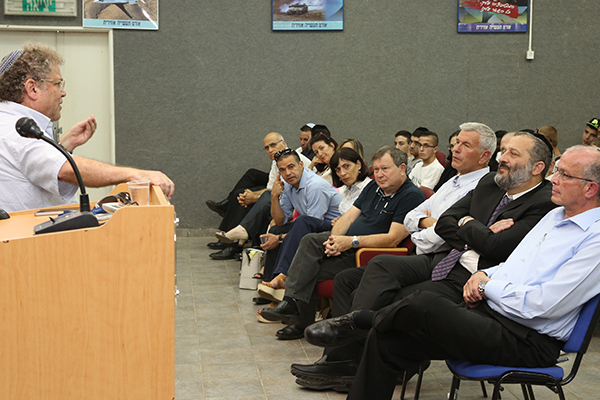 The IAI Sci-Tech school is collaboration between the Israel Aerospace Industry (IAI) and Israel Sci-Tech. Like all vocational schools, this one falls under the Ministry of the Economy. Hence Minister Rabbi Deri’s keen interest. The Minister met with students from various study tracks and expressed his satisfaction with the success of the educational model, with the school on IAI premises and an integral part of the IAI, and the role of the IAI I contributing to technological training and advancement. Israel Sci-Tech Schools, largest independent education network in Israel and leader in science and technology education. It is thanks to the warm embrace of the Ministry of the Economy and Israel Sci-Tech network that 90% of our students graduate with a diploma and we have a zero dropout rate. 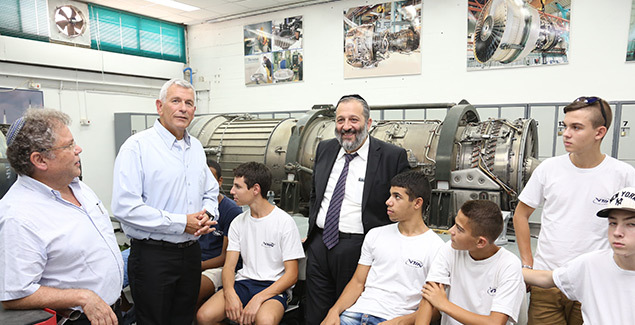 Yehuda Chorev, Principal, Israel Aviation Industries (IAI) Sci-Tech Vocational School (left of Min. 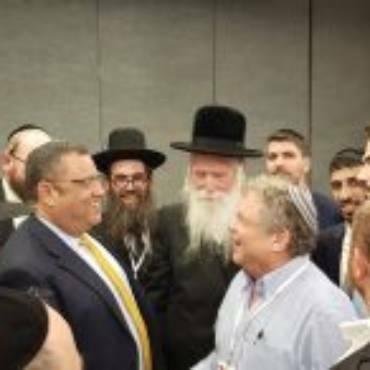 Deri) impressed upon the Minster and his delegation the warm embrace the school receives from the IAI, and the contribution of the Ministry of the Economy and the Israel Sci-Tech network. This support comes in the form of financial resources, providing special tutoring to students who need it, counseling and scholarships. All this, he stated firmly, makes possible the school’s 90% diploma rate and zero dropout rate.